Target is slowly starting to turn into the number one destination for smart beauty shopping! After picking up a few French brands a while back (among them Nuxe) and opening the doors of the US mass market to select Asian beauty brands, Target continues to develop their quality skincare offering as they start carrying derma e, the brand with the lotus flower logo #noticethelotus! derma e is not a new brand, but until today it was only available at specialty stores and natural grocery stores such as Whole Foods, Sprouts in SoCal, or online. In fact, derma e was launched a good while back in Southern California, before most people were concerned about what their skincare contained, and before kale smoothies were a thing. As early as the 80s, the founder Linda Miles realized that the quality of what you put on your skin matters as much as the quality of what you eat, and she started developing efficient eco-friendly skincare formulas. The idea was to incorporate the latest scientific discoveries into products that also harnessed the power of plants and vitamins. Beyond the quality of their formulas, derma e also implements strong ethical business practices: all the products are cruelty-free and GMO-free, all packaging is recyclable, and their manufacturing plant in Southern California is powered by 100% wind energy. The brand has a real commitment to the protection of the environment, and that's very important for me! 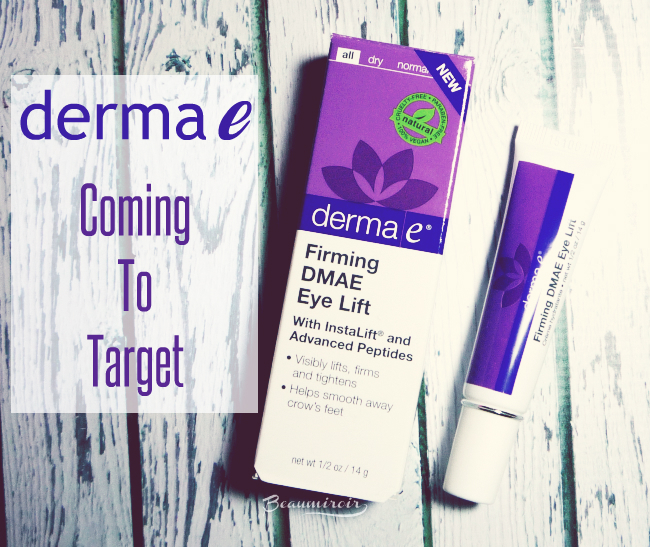 A handful of derma e's best sellers are debuting at Target this January: hydrating and firming moisturizers for day and night, and their Firming DMAE Eye Lift. I'm hoping Target will eventually increase the number of products they carry, because I've eyeing derma e's Hyaluronic Acid Serum for a while! For now you can find the entire range on derma e's website. If you don't find the lotus logo products at your local store yet, you can also check Target's website, it shows which stores around you have them in stock. The Firming DMAE Eye Lift, subtitled "With Instalift and Advanced Peptides", promises to visibly lift, firm and tighten while it helps to smooth away crow's feet. 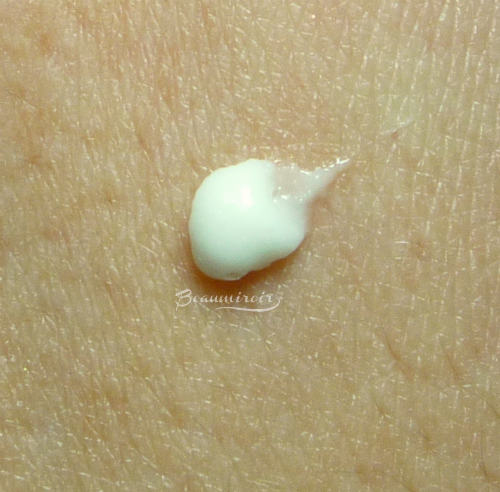 The star ingredients of this eye cream are DMAE, a ton of peptides and hyaluronic acid. It's a vegan formula that's also free of parabens. Here's the full ingredients list: Purified Water (Aqua), Caprylic/Capric Triglyceride, Niacinamide (Vitamin B3), Coco-Caprylate, Stearyl Alcohol, Glycerin, Propanediol (Zemea®), Lycium Barbarum (Instalift® Goji) Fruit Extract, Glyceryl Stearate, Hamamelis Virginiana (Witch Hazel) Extract, Diheptyl Succinate, Capryloyl Glycerin/Sebacic Acid Copolymer, Copernicia Cerifera (Carnauba) Wax, Dimethyl MEA (DMAE), Palmitoyl Tripeptide-38 (Matrixyl® synthe'6®), Acetyl Hexapeptide-8 (Argireline®), Sodium Hyaluronate (Hyaluronic Acid; Actimoist®Bio-1), Thioctic (Alpha-Lipoic) Acid, Panthenol (Provitamin B5), Sodium Ascorbyl Phosphate (Vitamin C, Stay-C® 50), Organic Simmondsia Chinensis (Jojoba) Seed Oil* (.1%), Caffeine, Hydroxypropyl Cyclodextrin, Allantoin, Xanthan Gum, Glyceryl Stearate Citrate, Phenoxyethanol, Ethylhexylglycerin. Although it's not mentioned by the brand as one of the top ingredients, I was really happy to see that niacinamide (vitamin B3) is very high in the list: it's in 3rd position! It's a potent substance that can do a lot for skin, from correcting discoloration to improving elasticity. The packaging is simple but perfectly functional: it's a classic squeeze tube with a screw top and a narrow nozzle so you can dispense just the tiny bit of product you need. The Eye Lift is a cream that feels rich and silky but never greasy, and it looks matte on. It's fragrance-free, but because of its natural ingredients it has a very light, pleasant smell. It glides well on the skin, so there's no pulling when I gently tap the undereye area to massage it in. It leaves my skin looking well hydrated and plump, with the fine lines less noticeable thanks to the good amount of moisture it provides. This is definitely one of the most moisturizing anti-aging eye treatments that I've tried in the past couple years. It takes a while for a skincare product to deliver on its promises, and it's best to judge the results after finishing a whole container. What I can say for now, having used the Firming DMAE Eye Lift for a couple weeks, is that it does a really good job at hydrating and plumping my hollow dark circles. The fine lines are softened and the skin looks more toned and firmer, so it makes my undereye area look healthier. 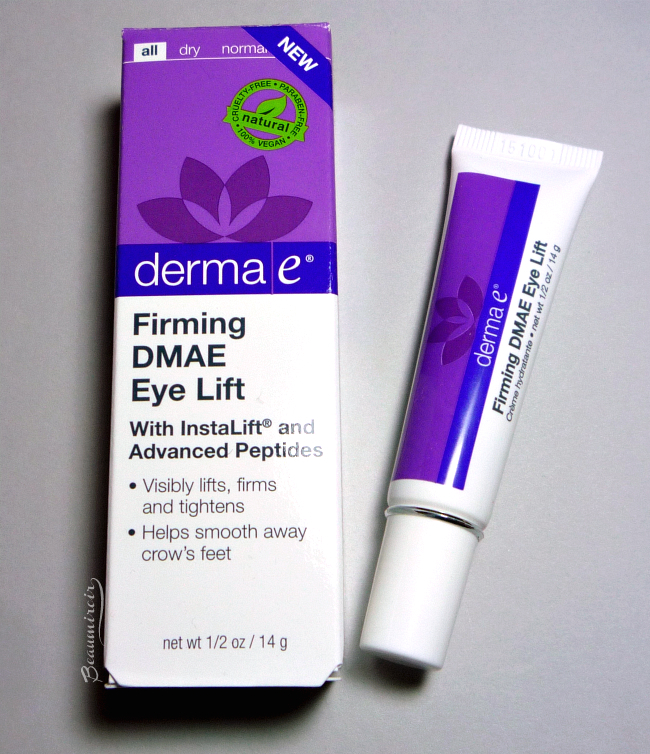 Overall: derma e's Firming DMAE Eye Lift is a very good choice if you need an eye cream that moisturizes the area really well and offers anti-aging properties for a more youthful look. At about $22 it's also a fantastic value for the quality of the formula! 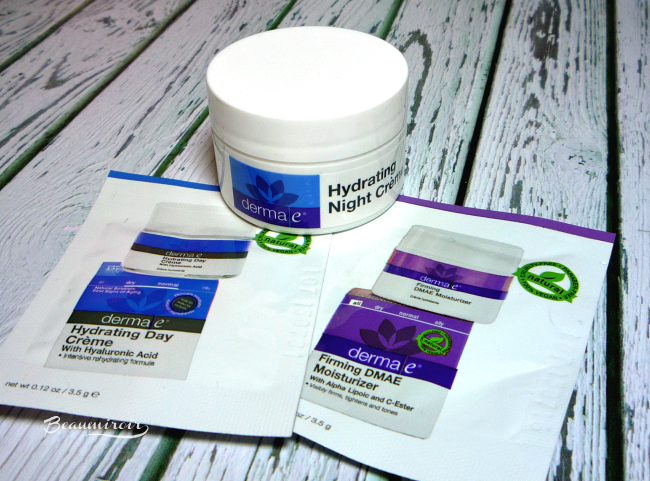 Are you ready to try something new for your skincare routine with derma e? What do you usually buy when you shop at Target? Do you spend hours in their beauty aisle like me? Where to buy? derma e's website or Target. This is a sponsored post. I received a monetary compensation to write and publish this post, which only reflects my personal opinion. The product was sent by the brand's PR for consideration. This post contains affiliate links.